The previous articles about the history of the “Chuckwagon” and the “Dutch oven” talked about their origin and how they became a mainstay in the early West. 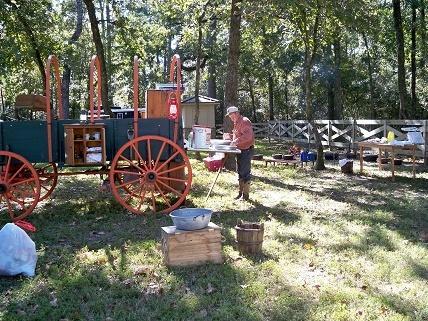 The “Chuckwagon” became the traveling camp kitchen for the cowboys and the ranchers in the late 1860’s. Today large modern day ranches still use a “Chuckwagon” in spring and fall when working cattle. For example the 6666, Moorehouse, Burnetts, Pitchfork, and many more ranches still run a wagon to feed their crews during roundups today. A group of cowboys on a roundup crew will usually number between 12 to 20 men and a cook. These men will be served three meals a day out of cast iron Dutch ovens. Breakfast, lunch and dinner – and I can tell you from experience that the cooks’ job is hard work. Breakfast is served before daylight, lunch at noon, and dinner around seven p.m. The creativity of the meals day after day relies on the cooks talents. Meat, vegetables, bread, and desert are served at every meal. An example of a typical evening meal at a cowcamp would consist of fried round steak, milk gravy, potatoes, pinto beans, sourdough biscuits, and cobbler. To accomplish this, a wagon has to be equipped with several ovens. The cooking gear on a wagon consists of Dutch ovens in various sizes, enamel coffee pots and bean pots, long handled spoons, forks, spatulas, and a gonch hook for moving and lifting the lids on the ovens. What size Dutch oven? Dutch ovens are primarily found in 8, 10, 12, 14, 16 and 20 inch sizes and run 3” to 4” deep. The 12” oven is the most popular size. A 12” oven will cook enough food for 2-12 people. You will find your selection and sizes of Dutch ovens will increase to fit your needs the more you cook. Vegetables – Vegetables are better if not overcooked. Remove from the fire and then reheat just before serving. Don’t add sauces or cheese until your are sure of the serving time. Fish – Usually fish cooks so fast you should wait until serving time before you start. Baking temperatures taken from regular cookbooks sometimes refer to slow, moderate, hot or very hot ovens. Those terms normally reflect the average following Fahrenheit degrees. Slow 0 250 to 350; Moderate – 350 to 400; Hot – 400 to 450; Very Hot - 450 to 500. The recipes for the previous issues have been smothered steak and fruit cobbler. This month we will feature two new recipes. These recipes will be “Cowboy Potatoes” and “Basic Frijoles” (pinto beans). Peel the potatoes; place in a pot and boil until tender but firm; drain and cube. In a bowl, mix the potatoes with the onion, ½ the cheese, and mayonnaise. Transfer to a 12” Dutch oven. Sprinkle with bacon, ripe olives, and green onions. Cover oven with lid and cook for 30 minutes with moderate heat. Ten minutes before serving add mushrooms and the rest of the cheese. This recipe can be cooked at 350 degrees in a 13” x 9” pan in a conventional oven. Wash and sort beans. Soak beans overnight. Pour off water and start with 6cups new water. Add salt pork, onion and garlic. Bring beans to a boil. Reduce heat and simmer until done. Do not add salt & pepper until beans are done. Next month we will talk about sourdough starter and bread making. So until then…. If you would like to comment on this, we'd love to hear from you. Please be sure to specify Chuckwagon in the form provided below. Your name and your comment will be posted in Letters to the Editor.